Biotechnology company YUMAB, a global provider of fully human monoclonal antibody (mAb) dis­covery and development, has recently relocated its headquarters and research and development labs to Science Campus Braunschweig-South, Germany’s infectious disease research hotspot. YUMAB is now colocated with the Helmholtz Centre of Infection Research (HZI), the Leibniz Institute-German Collection of Microorganisms and Cell Cultures (DSMZ) and the German Centre for Infection Research (DZIF): three world leaders in the fight against infec­tious diseases that provide an ideal environment for YUMAB to expand its global collaboration network in this space. YUMAB’s antibody platform enables the develop­ment of fully human antibodies, from the company’s universal libraries (1011) and from patient-derived libraries, against any type of antigen, even against full virus particles, bacterial and fungal cells. This approach delivers fully human mAbs with broad ranges of specificities and minimal immunogenic­ity that are ideal for the development of diagnostics and therapeutics. Since the US Food and Drug Administration’s 1998 approval of MedImmune’s Synagis (palivizumab) for the prevention of respiratory syncytial virus infection in newborns, only four other anti-infective neutral­izing mAbs have been approved: GlaxoSmithKline’s Abthrax (raxibacumab) and Elusys’ Anthim (obiltox­aximab), both for inhalational anthrax, in 2012 and 2016, respectively; Merck’s Zinplava (bezlotoxumab) for Clostridium difficile infection in 2016; and TaiMed Biologics’ Trogarzo (ibalizumab-uiyk) for HIV in 2018. But with the anti-infective mAb development pipe­line now representing one of the most active areas in mAb development2, YUMAB is poised to join the race to develop next-generation mAbs to fight infec­tious diseases. Fig. 1 | Driving anti-infective mAbs with YUMAB’s fully human mAb and target discovery and development platform. In the fight against pathogens, the adaptive immune system generates T cells and antibody-producing B cells that can provide lifelong immunity as a sec­ond line of defense if innate immune mechanisms fail. Prophylactic vaccination mimics an infection and achieves similar protection. However, immunization can fail owing to immunosuppression, lack of previ­ous immunity, outbreaks of emerging pathogens or imperfect vaccine design, requiring other strategies to stop or prevent an infection. mAbs offer the possibility to fight infections pro­phylactically and therapeutically, but pathogen variability, mutational resistance, multiple entry and pathogenic mechanisms challenge efficacy. Emerging strategies include the use of mAbs that tar­get crucial pathogen epitopes, oligoclonal antibodies and antibody–drug conjugates, all of which require robust and rapid antibody development platforms. YUMAB uses either its universal antibody libraries, which represent the entire natural human antibody repertoire, or immune libraries generated from infected or vaccinated patients for initial in vitro dis­covery. Bypassing animal immunization eliminates potential epitope preference by the host immune response, which can misguide antibody responses to non-neutralizing epitopes. Moreover, in vitro selec­tion results in high success rates and can identify antibodies of broad specificity for better diagnostics, vaccines and drugs (Fig. 1). Two YUMAB founders, Stefan Dübel and Michael Hust, have long track records in the development of neutralizing antibodies against HIV, Ebola, Venezuelan and Western equine encephalitis viruses, and bacterial toxins from Clostridium botulinum and Bacillus anthra­cis; protective antibodies against wild-type Marburg virus; and super-humanized antibodies against Aspergillus fumigatus and Clostridium diphtheria toxins. The combination of deep expertise in infectious disease and an advanced fully human mAb discov­ery and development platform makes YUMAB an ideal partner to drive infectious disease programs from basic research to clinical translation. The fully human mAbs developed at YUMAB can be tailored to the specific needs of any kind of mAb develop­ment program, at any stage, and with the properties needed for novel prophylactic or therapeutic strate­gies against infectious diseases. YUMAB is committed to accelerating the develop­ment of its customers’ anti-infective mAb pipelines with its antibody discovery and lead optimization platform, which has already generated fully human therapeutic mAb lead candidates in other areas. 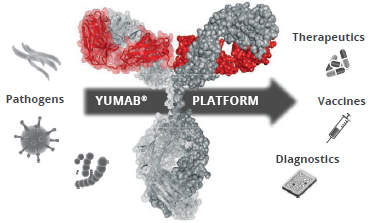 YUMAB’s flexible and broad collaboration strategy maximizes the impact of its antibody technology and is well suited for the development of novel mAb-based solutions in the infectious disease space. Marston, H. D., Paules, C. I. & Fauci, A. S. N. Engl. J. Med. 378, 1469–1472 (2018). GBI Research. Industry Pipeline for Monoclonal Antibodies Encompasses Over 2,800 Programs, says GBI Research. http://gbiresearch.com/media-center/press-releases/industry-pipeline-for-monoclonal-antibodies-encompasses-over-2800- programs-says-gbi-research (2017).